Towels are under-appreciated in the style stakes, I think. They are more than just functional; towels can add texture, colour and layers to your bathroom. 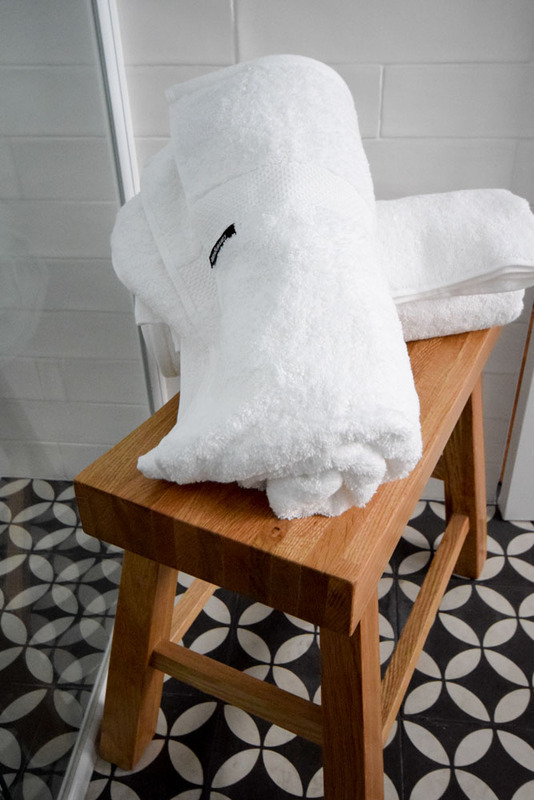 Today I’m sharing my best ideas to display towels in your home, thanks to Canningvale who provided these new luxurious 100% plush cotton towels. You won’t find any decorative swan folding tricks here, just contemporary and stylish ideas to display and hang towels in your home! 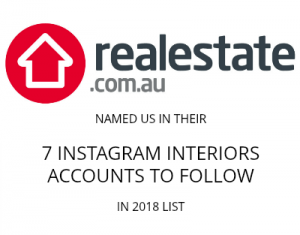 Check out this short video to see these ideas in action and if you like this video, subscribe to our YouTube channel to be notified when we upload other styling tips and tricks or home DIYs. The vanity can feel cold or stark so introducing warmth and texture with a styled vignette, candle and the all-important towel for texture can really soften this space. I’m trying to get back into better skincare so draping a face towel over the spout doesn’t just look pretty – it’s also a reminder to stick to this routine. 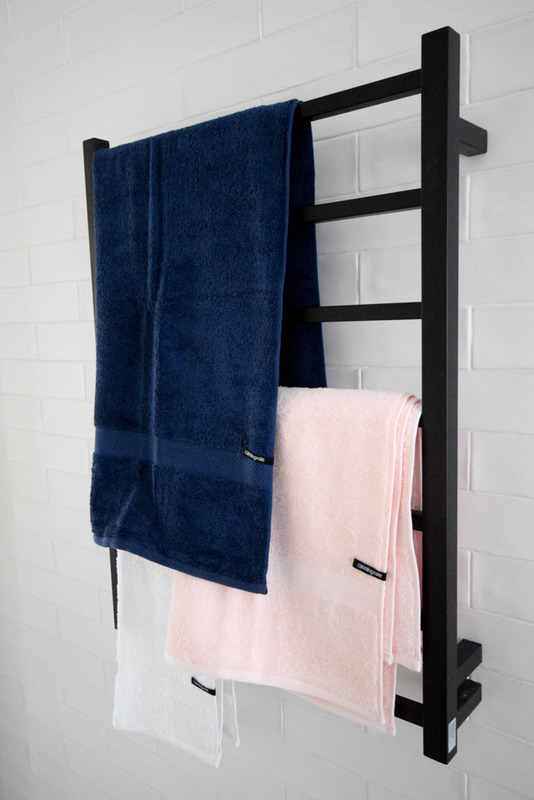 Towel racks like this matte black one have become increasingly popular in bathrooms and provide loads of possibilities to hang and display towels. Our bedroom has a blush pink and navy colour palette so I love the idea of carrying this through into our ensuite using navy and pink towels (also cute as ‘him’ and ‘her’ colours). A pop of white acts as the neutral to break up and soften these blocks of colour. You don’t need to hang the towels exactly the same on the rack, try different ways of folding the towels so some hang longer and overlap – it provides more interest. For those of you who have a single bar towel rail, you might like to try this idea of doubling-up towels like I’ve done on the small rail in our powder room. This space has a gorgeous grey-blue marble feature tile so I’ve selected an indigo hand towel and a white hand towel on top to tone down the intensity. Towels also look great hanging on the wall — adding dimension and a different texture to flat walls. You can place a row of towel hooks in line or offset them like I’ve done. I’ve opted for two of the same coloured towel in a mid-grey but you could really play with colour and hang a row of different coloured towels. Canningvale have a gorgeous selection of on-trend colours so you can’t go wrong! 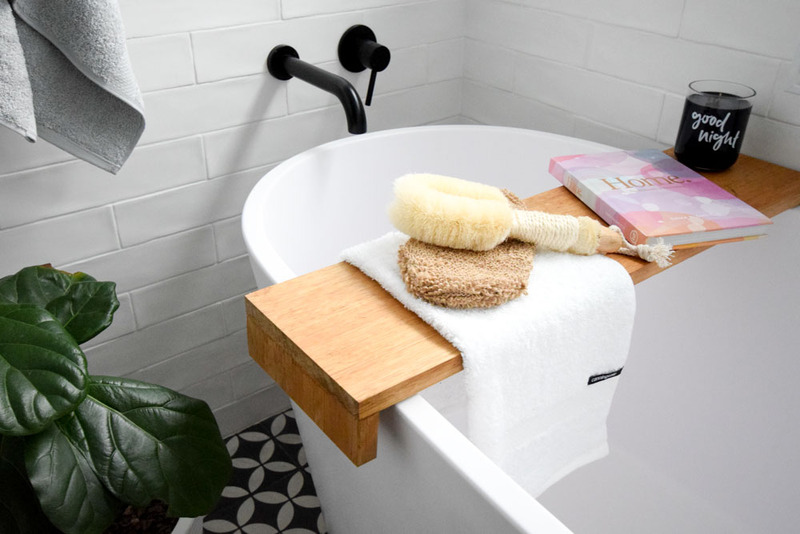 An easy way to give your bathroom a luxe feel is with a bath shelf or tray. I made this one (you can find the DIY tutorial here) and love playing around with styling on it. 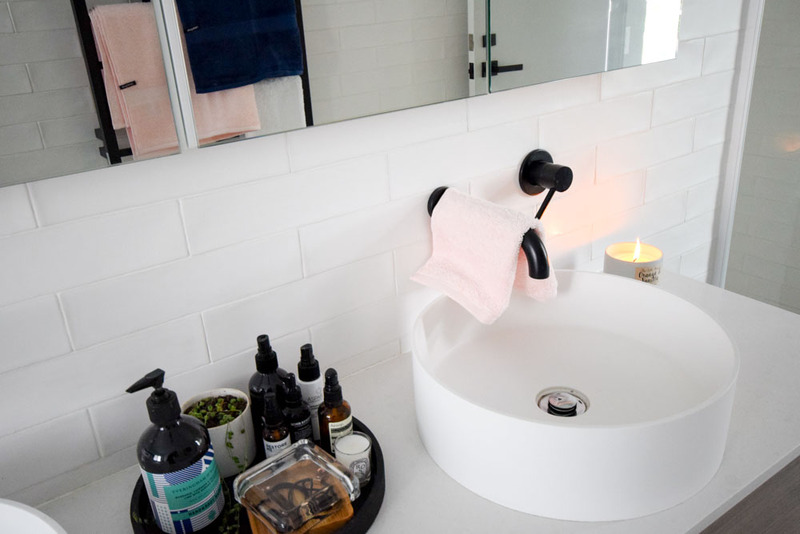 A towel draped over the shelf always looks stunning and creates a base to layer other items such as body brushes, books, candles and even small plants. 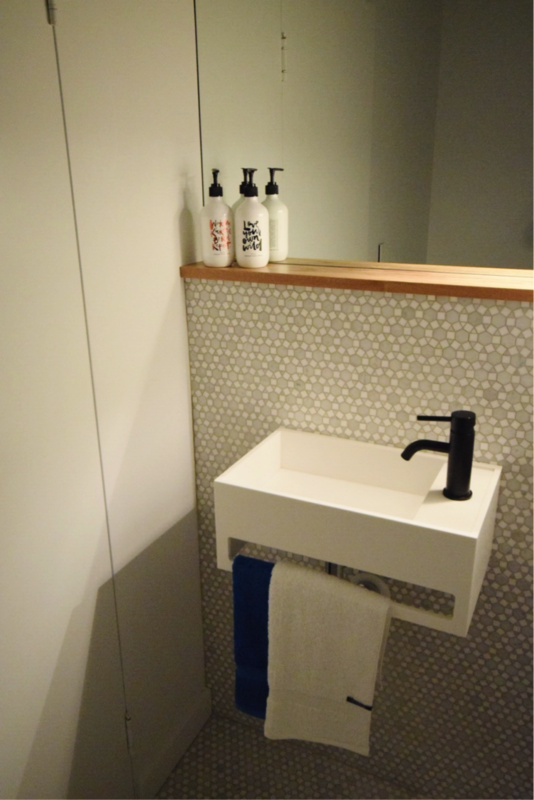 Check out these bathroom styling tips for more ideas. A decorative way of displaying your towels without being kitsch is to roll and stack them. Here I’ve placed two crisp white towels on a stool by the shower so guests can easily find them but this spa roll also looks great in an open shelf, in a basket or on the foot of a guest bed. The final towel display idea is to fold a face towel and layer a brush, soap, hand cream or other small item on top. This is another way of bringing the soft texture of towels to your vanity and puts the face towel within easy reach. How do you like to display towels in your home? I’d love you to share your ideas in the comments below so we can all be inspired! And if you want to get your hands on these luxurious new towels, go to the Canningvale website. Lots of great ideas what a stunning bathroom! I struggle with where to put a hand towel near my laundry sink so it just hangs over it but I’d really like some hooks or a rail somewhere it’s just finding space for it! Wow. Yesterday a friend of mine asked if I had any idea how to style a new bathroom for a photo shoot since she needs great pictures of a new project for her website. It’s not really my field of expertise, but I new you’d have pretty cool ideas. And I couldn’t be more right. Minimalist bathrooms are amazing, but sometimes they look empty on photographs, and adding textures and colors is an awesome trick. Also, “over the bath shelf” is a great detail. Timing can be so funny sometimes! 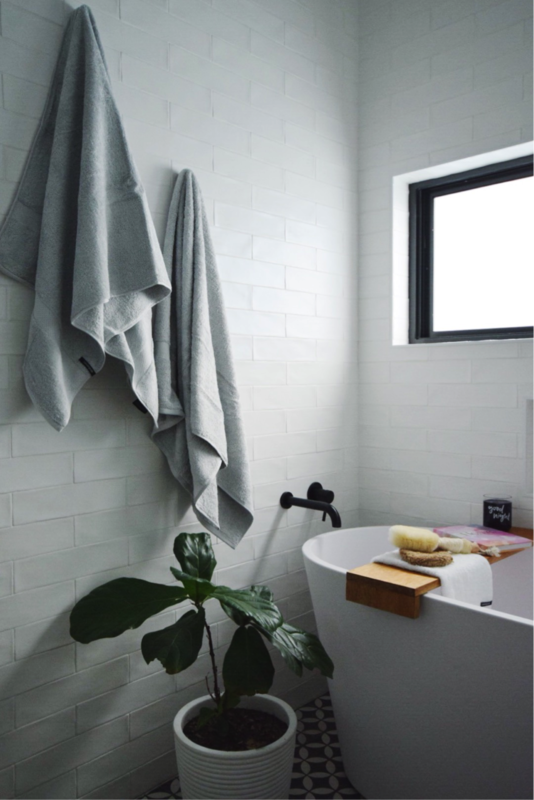 I agree that minimalist bathrooms can look stark without styling – towels, indoor plants, and luxe body products (as well as body brushes) are my ‘go to’ products… oh and candles! Oh these are some great ideas, I’ve been looking something like this. Great post!